March 26th is the 60th anniversary of the day "The Ballad of Davy Crockett" rose to number one on the US charts. "David Crockett" by Chester Harding (1792 - 1866) - cliff1066. Yes, accurate. He was born in East Tennessee. He had a ma and pa and most probably played with Tennessee forest trolls, which, as you know, are particularly ferocious. It was probably the forest trolls which caused him to run away from home at the age of 14. Hmmmm...independent child. Oh. Come. On! Reeeeeeally? Nah. No historian believes this, but it is part of his legend. He supposedly wrestled alligators too! 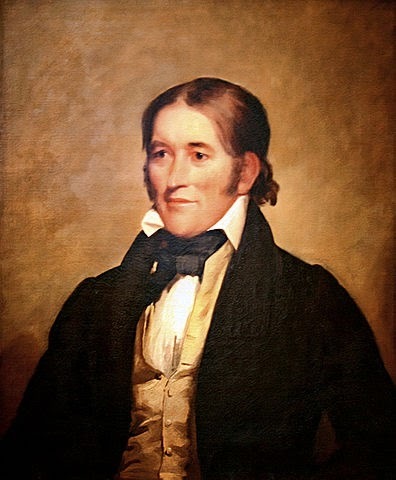 It is most probable that he was an excellent bear hunter, as described in his book A Narrative of the Life of Davy Crockett of the State of Tennessee. He knew how to wrestle dem bars! The song has the chronology backwards. He participated in the Creek War first (see below) in 1813, but he went to the Tennessee Assembly in 1817, then to the House of Representatives in 1827 (where he stayed until 1835). I've seen the Liberty Bell--it's still broken. So folks, this is metaphor. The rest of the verse talks about him fixin' Congress and the Government, so, patching the Liberty Bell is a metaphor for fixing our "liberties." NOT! Whew. I really like Davy, so I was set to be disappointed when I'd heard he fought in the Creek War, but that didn't happen--neither his fighting nor my disappointment. According to Wikipedia, Crockett enlisted as a scout in 1813 under Francis Jones and Colonel John Coffee, and, "Crockett often hunted wild game for the soldiers, and felt better suited to that role than the killing of Creek warriors and families." His aversion to killing Indians in this war makes total sense when combined with the fact Crockett could not stand Andrew Jackson's anti-Indian policies and fought against them vehemently. But it is amazing once you know that Creek Indians killed Davy's grandparents! According to Wikipedia, his youngest child, Matilda, described her father the last time she saw him: "'He was dressed in his hunting suit, wearing a coonskin cap, and carried a fine rifle presented to him by friends in Philadelphia ... He seemed very confident the morning he went away that he would soon have us all to join him in Texas.'" club in Onderdonk's 1903 painting The Fall of the Alamo. Crockett's mythological status started growing while in Congress, and it was a two-fold process. First, he published his autobiography, and then, James Kirke Paulding wrote a play called "The Lion of the West" that parodied Davy. It showed him as an uncouth-but-funny Tennessee backwoodsmen named Nimrod Wildfire. This play became popular, and so did Crockett as a result. So, writers, let this be a lesson to you. Write a book about your crazy antics, pay someone to parody you, and then tell everyone to go see the play (or buy the DVD, or click onto the YouTube link...) and read your book. You will be famous! His myth kept growing until well after his death and hit its height in the mid-20th Century with a Disney mini-series starring Fess Parker, which created a merchandising frenzy for everything "Crockett," including coonskin caps! So, it's logical that the song, "The Ballad of Davy Crockett," the miniseries' theme song, was #1 on the US pop charts on March 26th, 1955! And here is the Disney version. Davy has a Wiki Page. Here are some books by him and about him on Amazon, including Narrative of the Life of David Crockett of the State of Tennessee.